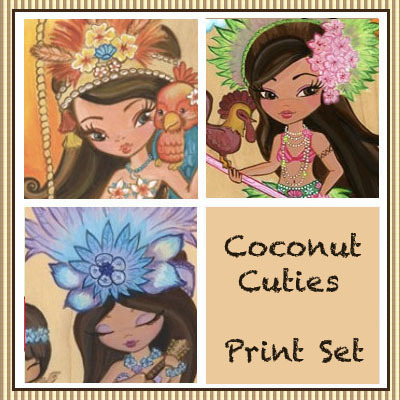 There are three paintings in my original series of the lovely Coconut Cuties. I have an obsession for all things Hawaiian. So I felt compelled to create a collection of paintings. This listing is for the entire set of prints. Luau Lulu - She loves to swing until sunrise with her parrot. Kaylie Ukelele - She plays so beautifully, everyone dances to her music. Lanakai Kauaii- This little lady goes by the name of Lanikai Kauai. She lives to paddle board! She often picks up feathered passengers on her pineapple shopping trips. All artwork and content � 2010 tsai-fi Copyright stays with artist and does not transfer with sale. tsai-fi watermark is not on print. This print set is a great deal at $66. Each print is normally $28. This is a savings of $18 total.